When you see that the check engine light is on in the car, it can be alarming. At Road Runner Auto Care in Apple Valley, California, the mechanics will connect a coding machine to the car to find out what codes are being given to better determine what could be causing the light to be on in the first place. Once there is an indication as to why the light is on, then the mechanics can begin to look at how much it will cost to repair the car and what it will take to maintain the vehicle so that the light doesn’t come on again. A simple reason as to why the engine light would be on is a loose gas cap. This will allow air to enter the fuel system, or moisture, and cause the light to come on until the cap is tightened. The oxygen sensor is another common reason as to why the engine light would come on in the car. This can sometimes be an expensive repair, but once the sensor is changed, then it usually doesn’t cause any other issues. Road Runner Auto Care mechanics have seen vehicles with the engine light on because the vehicle needs an oil change. Some cars are set to have the light come on as a warning so that you’ll know that it’s getting close to the mile mark of getting the oil changed as well as some of the other fluids in the car. Faulty spark plugs are also an issue that can cause the light to appear. Road Runner Auto Care in Apple Valley and the Victorville area can change the plugs and the wires so that the car gets there is a proper spark in the car. 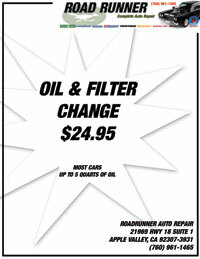 Another issue that Road Runner Auto Care mechanics want customers to know about is the thermostat being faulty. While this doesn’t seem like it would be connected to the engine light being on, it can make the light come on as an indication that the coolant temperature isn’t where it should be or that the thermostat is faulty.